Colorkitten's Action Blog: halloween baby! Absolutely adorable,I am so impressed with your skills! Beautiful job as usual gal!! thanks guys!! I was really happy with the suit when all was said and done. Although I made the hood TWICE (ears were too small the first time). The claws are my favorite part, I think! yeah, we aren't in a door-to-door neighborhood and we didn't want to drive to a strange neighborhood just to do a few houses. The mall was fun for her (and fun for us to see all the costumes!) Next year though!! Oh my goodness.. she is just too darling! And Deb, thanks! I mean, I know *I* think so, but I'm maybe a teency bit biased. That looks great! Don't worry, I had a friend who dressed up as a Katamari prince one Halloween. She looked awesome! Wow! You did an awesome job on that costume and she is ADORABLE! I've always admired all your creative skills. nice to meet your awesome blog jinjur mommy! what a darling little cheburashka. is that a monkey? ham the chimp astronaut? that's amazingly cool! 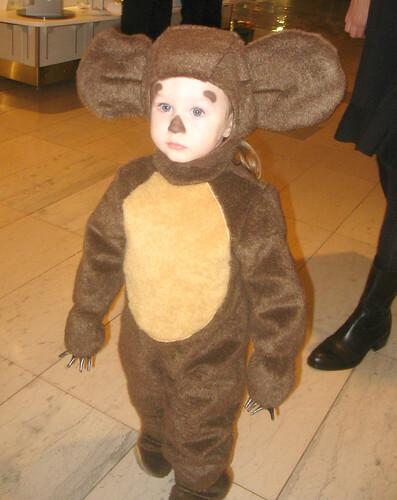 I just came across your post about the Cheburashka costume. I love it!!! I am looking for one for my 2 year old. Do you know where I can find one or do you sell versions that you sew?